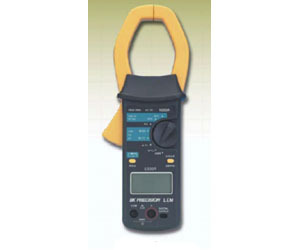 Model 5330A is a power clamp that offer the capability of AC/DC power and power quality measurement. In addition to Watts, VA, VAR, and power factor readings, this instrument gives accurate current, voltage, and frequency measurements. The unique SmartHoldTM feature means that a complete set of readings for all seven parameters can be stored and displayed at any instant. A 25 segment bargraph gives an immediate indication of analog values and ranges and allow dual parameter display in Power Factor and Frequency modes.